Turkey Hangover? Get up! 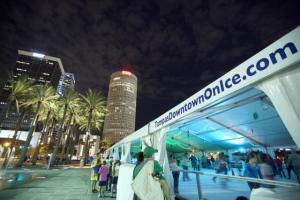 There's lots to do this Weekend in Tampa Bay! Turkey Hangover? Get up! There&apos;s lots to do this Weekend in Tampa Bay! With over a million twinkling lights, Christmas Town is back for another year. Plan to fill your senses with seasonal sights, sounds and flavors. A beautiful family tradition for many. A full weekend dedicated for our adorable tuxedo-looking-wearing friends. Penguin themed activities including scavenger hunts, special penguin shows and SCUBA divers. Will the Tampa Bay Lightning streak continue? We hope so! Puck drops at 4 p.m. This art show returns for its 11th year in a row, featuring local and independent artisits crafting handmade, one-of-a-kind items. 10 a.m. to 4 p.m.
21-time Grammy Award-Winner Kanye West returns to the Tampa Bay Times Forum for his fall THE YEEZUS TOUR. We wonder if fiancé Kim Kardashian will join him? 8 p.m. Located at 601 Ashley Dr., across from Curtis Hixon Waterfront Park during this Sunday’s downtown market, guests can enjoy free photos with Santa (from 11am-2pm). There will be an area to make non-perishable food donations. Oh! And photos with Santa aren’t just for the kids, Fido is invited too! Shop hand-made gifts, local produce and even Poinsettias. Stroll back in time while Victorian holiday traditions come to life! 10 a.m. to 8 p.m.
One of my holiday favorites, Elf will be showing at the historic Tampa Theatre along with other Holiday Classics throughout Sunday afternoons through the holiday season. 3 p.m. Celebrating 15 years this multi-platinum rock opera will knock your Christmas socks off! 3 p.m., 7:30 p.m.
FREE yoga in the park at sunset from beginners to experts, all levels welcome! 5 p.m.